As we continue our travels, what comes to light, particularly in south-east Asia, is a deeper understanding of how each country is meeting its citizens basic human needs. You can read about this, you can see photos, you can even watch a video, but it is not the same as seeing it first hand. As we move from place to place, I look into the alleys and around the corners. I want to pull back the curtain and see what a country is really like for the average person. I don’t want to only see what the tourist industry holds up for me to experience. This is where a country puts its best foot forward. You get the positive view, the one you are meant to go home and tell your friends and family about. But, that is not the only picture of a place. In fact, it is a poor indication of what a country is really all about. This is the root of the problem though. If we only bring back the ‘real’ stories, most people at home would never come to these poor countries. For example, I was plenty worried about traveling to Cambodia based on my memories of Vietnam. I also assumed, correctly, that Cambodia would be worse in terms of endemic poverty. I was concerned about the reaction of my children, since what they would see might be alarming. What we have found in all the stops so far, is the humanity of these places is not defined by money. That is not to say life wouldn’t improve with increased wealth. But, with what they have, people have done their best to carve out a relatively good life. We saw more smiling faces on people of all ages in Siem Reap than we have ever seen back home. A young man with a coffee business marvelled at how we could leave our parents and move far away from them, only visiting once in a while. In Phnom Penh, my husband was offered a beer by a man who thanked him for helping his country. He said that just by ‘being there’, we were helping. A driver for hire in Bali, originally from Java says he loves Bali for the clean air, citing the lack of industry on the island. This kind of thinking has always led me back to the question, ‘what is truly important’? I am getting a better understanding of this with each day we are away. What I once thought was most important is either reinforced or challenged. I end up being more grateful for what I have in Canada, than ever before. Which leads me to wonder if Canadians really have it that much better or is it just what I am used to? Are some of the things I am grateful for not basic human rights? Should access to clean water, for example, only be something that wealthy people have in certain pockets around the world? ‘social progress’ as the capacity of a society to meet the basic human needs of its citizens, establish the building blocks that allow citizens and communities to enhance and sustain the quality of their lives, and create the conditions for all individuals to reach their full potential. This may sound lofty, but I am starting to think we can all have a higher level of these basic human needs covered by our countries governments and industry. I think it is both sectors of the economy which need to play a role. Not one or the other, and certainly not one against the other. 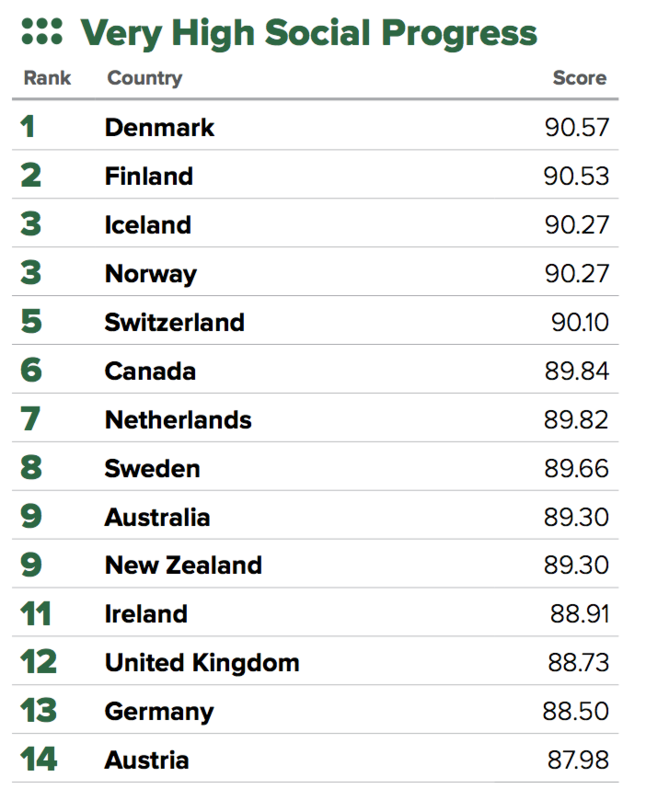 I think what is interesting about the high-ranking nations on the social progress index, is the ability of government and industry to work together. Although it probably takes all people of a country to make a concerted effort towards fulfilling the criteria of these basic needs. It has to be a universal goal. Here are the 12 components of the framework with between three and five specific outcome indicators. The indicators are measured appropriately with a consistent methodology by the same organization across all of the countries sampled. Over time, trends are being measured to see how life is improving or in some cases, getting worse. Based on this criteria, my home country scores well, coming in at #6 amongst the 14 countries with ‘very high social progress scores’. I’m not happy about this just for the relatively high position, but for what that represents. Because the difference in the rankings, within this group of countries is a relatively small gap. I think what is significant is the company we are keeping. A group of nations with similar social priorities. What is even more significant is that countries like Canada achieve good scores with a large and diverse population. Something which the Scandinavian nations do not have to contend with. However, all the nations in the top category have achieved success which other nations can learn from. The ‘very high social progress’ countries also transcend the ‘basic human needs’ indicators. For being able to have access to ‘opportunity’ and the ‘foundations of well being’ puts us in the world’s top 1%. It is easier to understand why it is so difficult for emerging nations to catch up when they require so much of their resources to attend to ‘basic human needs’. Which shows how much work is yet to be done. We can all play a role in a brighter future. While a countries GDP is critical, it is important to pay attention to the other indicators which make a good life. Luckily, in most cases as GDP rises, so do the 12 indicators of social progress. We continue to travel more mindfully of where we can invest our tourist dollars along the way. In that endeavour, we continue to learn about what can be done now, in country and how we might continue that work after we return home. For even though Canada ranks high globally, there are plenty of Canadians who are not doing so well on any number of the 12 indicators. By turning our attention towards our fellow citizens we will realize, there is plenty left to do! ← SMART goals and New Years resolutions, why bother?